I don't know what it was about this year, but it seems like I just never got my act together for Christmas. Maybe it's because we travel so much for the holidays - we had two week trips to visit family for both Thanksgiving and Christmas, plus Tony spent two weeks of December in China. 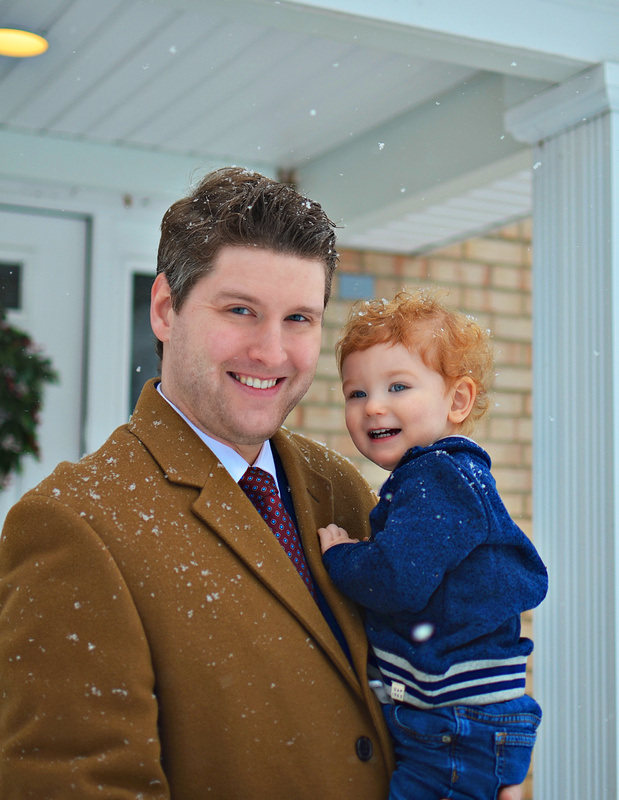 With so much travel and time away from home, it never really felt like the holiday season to me. So much so that Tony and I didn't even bother to exchange presents! With Valentine's Day coming up, I wanted to do something a little extra special this year beyond a box of chocolates to make up for our lack of time together during the holidays. Tony has always been an avid watch collector, and he especially loves unique watch designs. 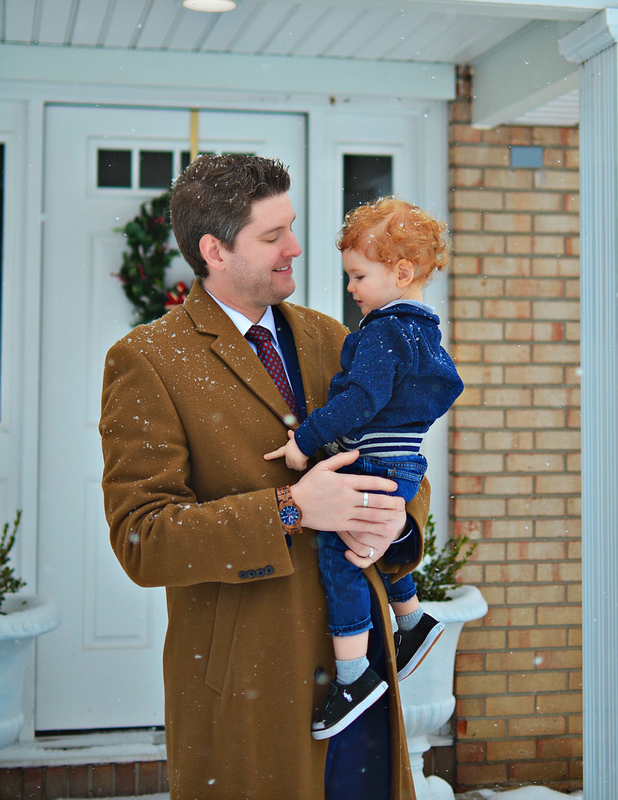 But, with all the responsibilities that come along with a family and house, I knew it has been a couple years since he had the ability to find and purchase a watch that really stood out to him. 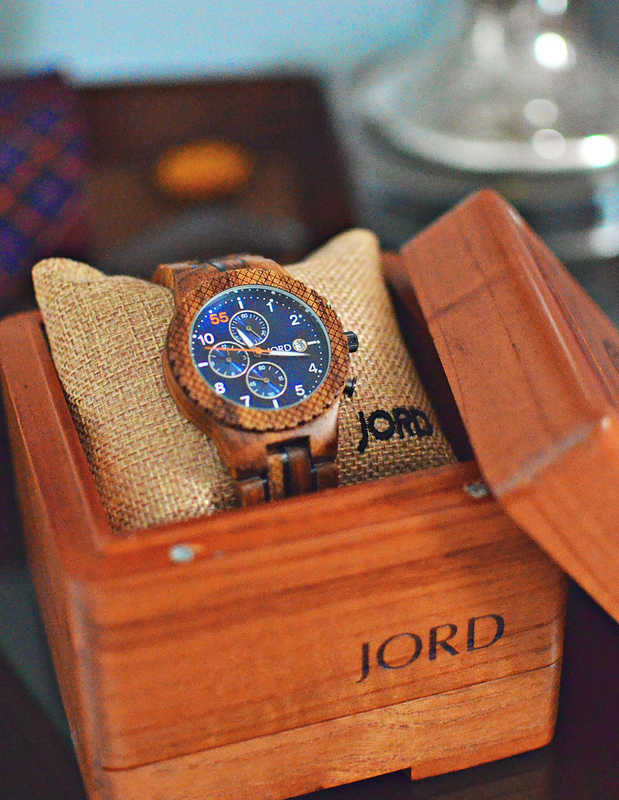 So when I came across Jord Watches, I thought they would make a great Valentine's Day present! 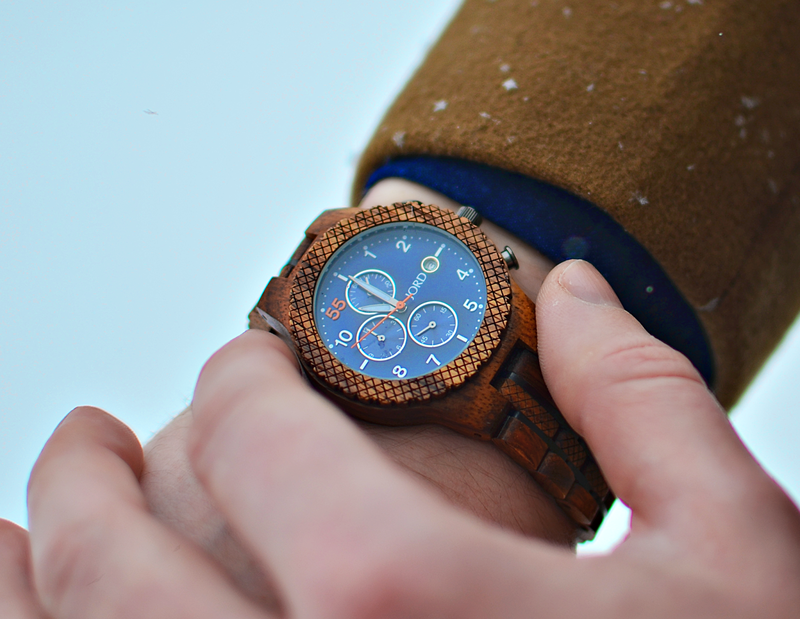 These watches are so unique - they're actually made out of wood! Tony started getting into woodworking before we moved to Buffalo and has been collecting all sorts of interesting pieces of wood. The previous owner of our home even left him a wood lathe, which he was super excited about, so it was really cool to find a gift that combined two of his favorite things! There are a ton of unique mens watches to pick from, so trying to decide on one was kind of a tough call. I ended up picking out the Conway for him for two reasons: First, it's made of a really interesting wood called Kosso, which I had never heard of before, so I thought he'd get a kick out of how exotic it was. Second, it has a blue face, which pairs well with a lot of his work suits, but also jeans, since sometimes he's working in the lab or just hanging out on the weekend. At first I was worried that the band would be too delicate, I mean, soil engineers tend to work with their hands a lot so I wasn't sure if it would hold up - but when I checked out the details, I saw that it actually has a steel band interlocking with the wood. 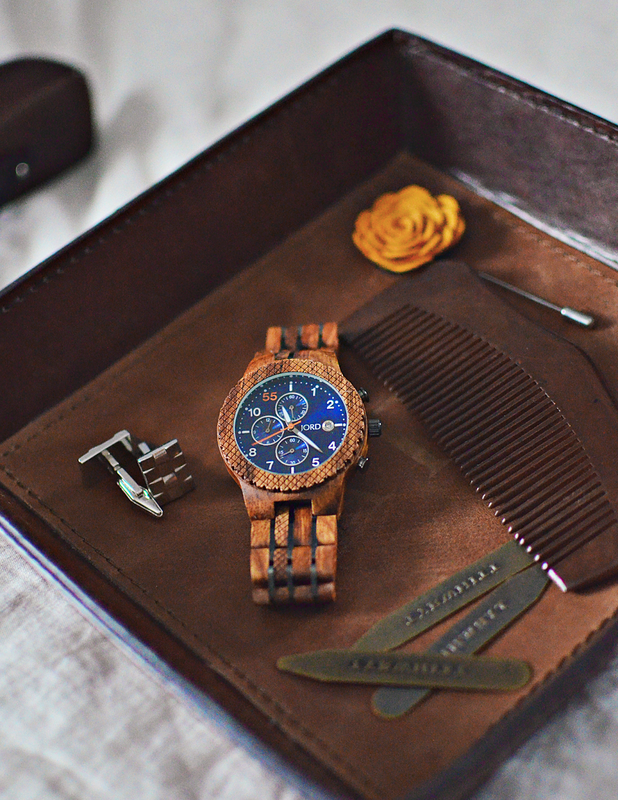 Oh, if you can somehow manage to subtly measure your guy's wrist (or I guess the easier thing to do may be to check one of their other watches, but maybe you’re super smooth), you can get your watch band customized. Usually I'm home when the mail comes but of course the one day I was out and Tony was home, the watch arrived and he saw it immediately. 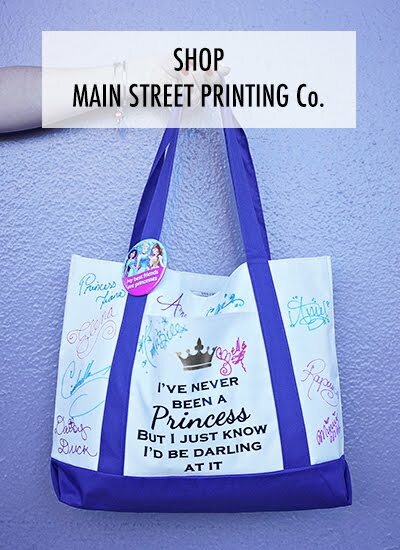 So ladies, if you're ordering one for your man, make sure he isn't home when it arrives! So, that's how it ended up being an *early* Valentine's Day present instead of just a Valentine's Day present. Does this mean I have to get him another present??? ha! I'm hoping that a box of chocolate will be enough! 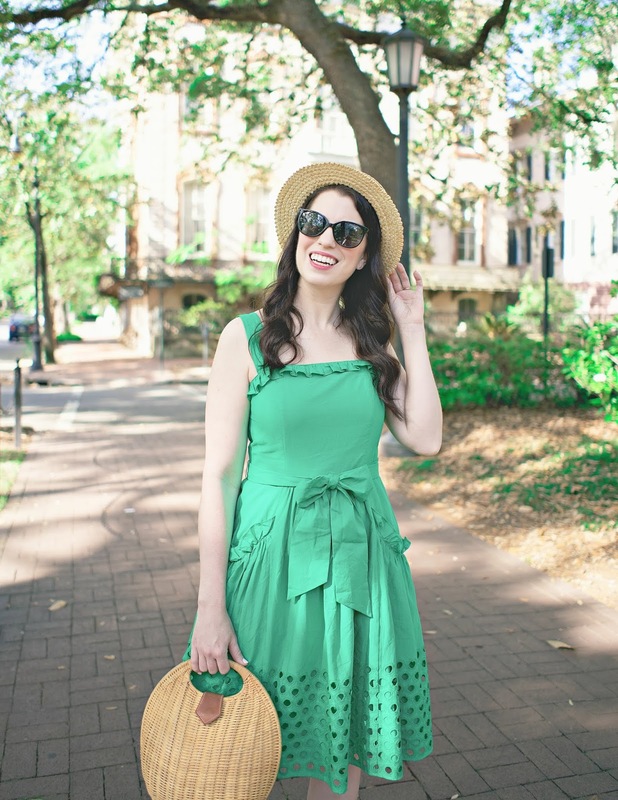 And if you'd like one for yourself, my favorite women's design is the Cassia in Walnut and Rose. 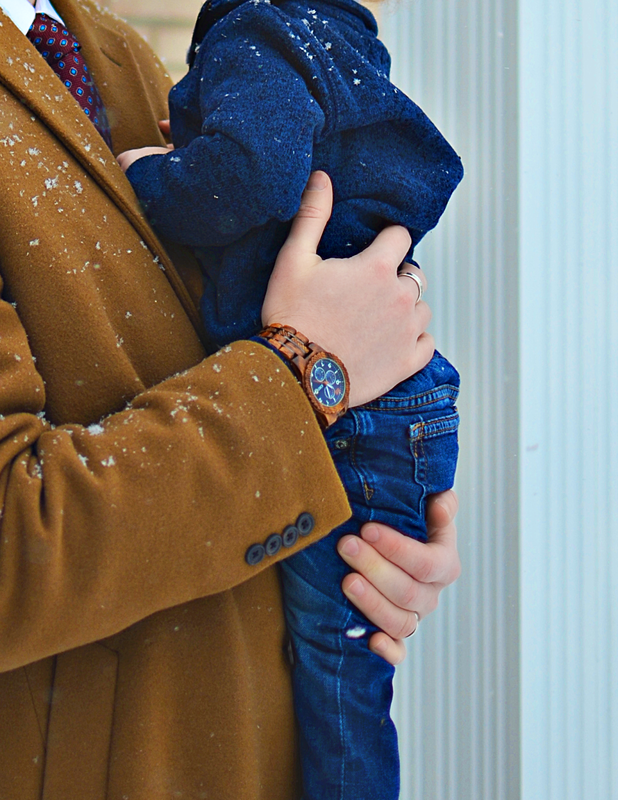 Tony loves his watch so much that I have partnered with Jord to giveaway a $100 gift code to use on their website, plus, anyone who enters will get a 10% discount code once the giveaway ends! Entering is super easy, all you have to do is follow this link and provide your contact information. The giveaway will close January 21st at 11:59pm. The $100 and 10% Gift Codes will expire February 4th, 2018.